Oh, how I have been looking forward to another Tom Reynolds investigation and this latest from Jo Spain most definitely did not disappoint! 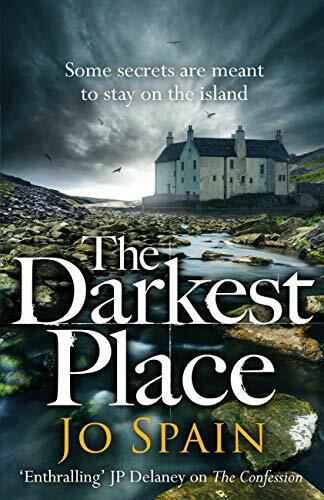 In this book we join DI Tom Reynolds and his loyal team of Ray, Laura and Linda as they are called to an old asylum on a remote island off the west coast of Ireland. It is being redeveloped and a mass grave has been disturbed. Most bodies are of ex-patients but one is thought to be that of a doctor who went missing Christmas Eve 40 years ago. As well as following the team throughout their investigation, we also get to read the diary which Conrad’s wife had in her possession. In it, concerns are raised about the treatment of patients in the asylum, callous treatment of vulnerable people with mental health issues, many of whom who probably shouldn’t even have been in an asylum. Had this diary given someone a motive for murder? And was it a patient or a staff member? There was a real ‘closed room’ kind of atmosphere while the team were on island. There was no WiFi, a patchy mobile signal and important documents had to be sent back to the team on the mainland using a fax machine. The author created a really spooky atmosphere in the old building which was compounded by dark and dreary weather. Sometimes those on the island were effectively trapped as the boat to and from the mainland only sailed if the sea was calm enough. This all added up to give a really claustrophobic feel to the novel. There were so many people it seemed with things to hide both past and present and many had possible motives to kill Conrad. But Tom and his team could never have guessed what darkness the building was hiding – and neither did I. The book shone a light on the way people with mental health issues were so badly treated in the not so distant past. There were people kept in the asylum who may never have even been considered in need of help these days. One of the doctors does comment that people were doing what they thought the patients needed at the time but some of the so-called treatment was just cruel and inhumane. Jo Spain’s first novel, top ten bestseller With our Blessing, was one of seven finalists in the Richard and Judy Search for a Bestseller Competition. It was named as an Irish Times crime fiction book of the year by Declan Burke. Beneath the Surface (2016) and Sleeping Beauties (2017), the second and third in the DI Tom Reynolds series followed, to further critical acclaim. Her standalone thriller, The Confession, released in January 2018, became a number one bestseller and sold in multiple territories. Jo is releasing the fourth Tom Reynolds, The Darkest Place, in 2018 and a new standalone Dirty Little Secrets in 2019. Jo’s debut novel was set against a background of the infamous Irish Magdalene Laundries and Mother and Baby homes. The author’s own father was born in one such home in Dublin and the novel’s backdrop was constructed based on the in-depth research she undertook while attempting to trace her family roots.